These date from c1920's and they depict a beautiful rural scene in the centre. These were made by W. Baker & Co Ltd and are in the 'Woodland' pattern. very best to sort it out. 'green' (and also to save money!). Sadly these plates have suffered in the past are chipped but believe the attractive pattern/image would attract the collectors. Blue transfer of a man fishing by a bridge with a house in the foreground. Antique Ceramic Plate, Blue Willow Pattern Transfer. Warranted Staffordshire. Stamped warranted Staffordshire J M & S on the bottom. The plate is in good overall condition. It has the usual crazing of pieces of this age. 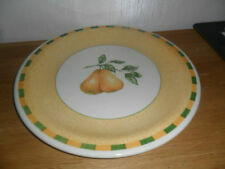 Churchill Blue Willow 3 x salad / dessert plates 8" or 20.50cm wide. They are very very lightly used really nice condition. 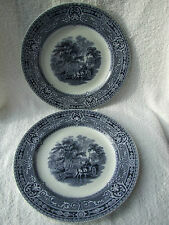 Churchill Blue Willow 2 x salad / dessert plates 8" or 20.50cm wide. They are very very lightly used really nice condition. An Early Victorian blue and white willow pattern plate from the studio of Bells of Glasgow. Stamped J & M.P.B & Co on the bottom. This Stamp was used by Bells of Glasgow from 1850 to 1870. The plate is in good overall condition. 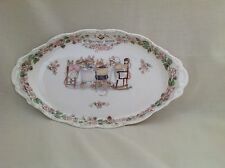 ENGLISH IRONSTONE POTTERY. ' OLD WILLOW '. DINNER PLATES. AND ONLY MINOR SIGNS OF USE. 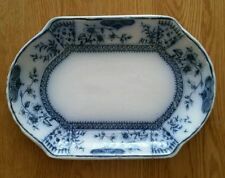 The blue and white floral square lidded pot is made by EIT, English Ironstone Tableware and is in excellent condition. The pot is approx 4" (10cm) tall and 4" (10cm) wide including lid and handles. ENGLISH IRONSTONE POTTERY. ' OLD WILLOW '. DINNER PLATES. Sadly these plates have suffered in the past are chipped but believe the attractive pattern/image would attract the collectors. Blue transfer of a church on the left hand side of the plate and a windmill in the foreground on the right.